Police officers stand guard next to prison bus which carries British banker Rurik Jutting upon his arrival at the High Court in Hong Kong, Dec. 12, 2017. A British banker sentenced to life in prison for the gruesome murders of two Indonesian women went before a Hong Kong court Tuesday to appeal his conviction. 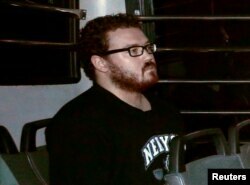 Rurik Jutting was convicted last year of the 2014 murders of Sumarti Ningsih and Seneng Mujiasih in his luxury apartment. Jurors were shown graphic video Jutting took on his cellphone of him torturing Sumarti and snorting cocaine. The body of one of the murdered women was discovered stuffed in a suitcase. The court rejected the 32-year-old Jutting's attempt to plead guilty to a lesser charge of manslaughter on the grounds of diminished responsibility from alcohol and drug abuse, and sexual disorders. The Cambridge University graduate watched from the defendant's box during Tuesday's hearings as his lawyers argued the judge incorrectly instructed the jurors in the original case on assessing their client's psychiatric maladies. The hearing will resume Wednesday.